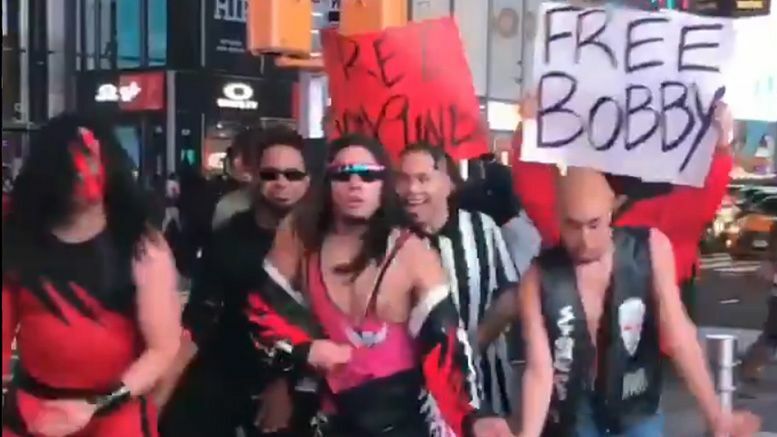 Lots of random stuff goes down in Times Square, but this video of a WWE-themed dance in honor of Tekashi 6ix9ine may take the cake. YouTuber Tim Hann Rivera shared a video on Friday night showing he and his crew dancing in Times Square while dressed as WWE legends. While they dance, their friends are holding signs in the background, one of which saying #Free6ix9ine. For those unaware, 6ix9ine was arrested days before Thanksgiving. He’s facing up to 32 years in prison on racketeering charges. There isn’t much further setup needed for this one, so just watch and enjoy. BTW — if Kane looks familiar, it’s because these guys recently went viral for dancing in the subway.